​Natural Laws are observable facts that explain our world. Newton was the king of putting them down. Alright, at the subatomic level, where Quantum rules, and I don't mean James Bond, Newton may not be right, but in the material world, the one we live and work in, his laws are better than right, they are effective. Why in heavens name am I sharing this... how can you use it. Be patient, there is a huge payback. ​If you are serious about not working too hard, you need to review the First and Second laws of Thermodynamics and force yourself to give them have a WOW factor! ￼It takes work to keep organized and overcome resistance to change and left alone, energy gets wasted on chaotic and unnecessary things...​ it's only Natural to Manage Naturally. The Universe is a creature of habit and left alone, declines into disorder; though everything in it is made up of energy, there is only so much of it: in other words, we live in a stubborn, change resisting, sometimes shortsighted universe. In other words: What goes around comes around! Everything has a price: what are you willing to pay? ￼Like the Universe itself, we​ are creatures of habit. Because of Inertia, we have to work hard to change a habit and because of Momentum and Reciprocity, The longer we wait the harder it is as it has built up momentum, and we need to take care what change we make and how much force we use to change it, as it will become the new habit, and too little force and it won't change, too much and the extra force will create chaos. Like the time I ran into the kitchen screaming and yelling when a simple order would have worked, and the tension created led to distrust, and people hiding their mistakes. You see, when habits meet the needs of the real world, we succeed, when they don't... well look at the world around you! To use it is really quite simple. You find something you want to change at work. Then you ask yourself, how long has it been happening (how much time has been invested in reinforcing the habit), and how much force is behind it? Take a shot at it, it will be your theory. If your memory is as unreliable as mine, write it down, so you don't forget. Then look at the chart below. The vertical axis is the time invested, from short to long. The horizontal axis is the energy invested, from low to high. So find where you think the thing you want to change is on the time axis and the energy axis and see where it falls. For instance, you have a problem and your theory is that it has been going on for a long time, but there isn't really that much energy invested anymore, then it would fall in the DECAY: Habitual square, and you would try what it says to deal with the problem, as an example. Of course, what you have is theory. How right your theory is you will find out when you try doing what is suggested. If things don't change the way you want them too then you either misread the time invested or the energy, so go back to the chart again, adapt and try the next step. Another way to use it is when you do something silly like I did, and over or under shoot the solution. You can use the chart to try and figure out what went wrong. 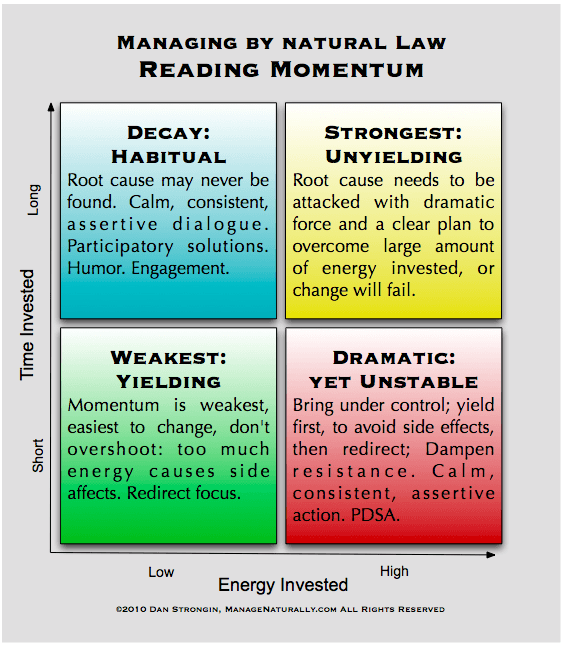 In time, as you play with it, you will get better at reading and reacting without overreacting and creating unwanted side effects, or under reacting and having little if any effect. 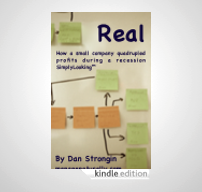 An example of the STRONGEST:UNYEILDING solution to a problem I describe in my book, "REAL, How a small company quadrupled its profits in a recession SimplyLooking™​"
"Over the course of a few days, I sat down and talked with key people. I walked the grounds and the plant with a quiet mind, simply looking. I witnessed a high level of dysfunction. I noticed, as I passed by, the fear on the downturned faces of the workers. I listened to accusations, finger pointing, insinuations, and other signs of degraded morale in the ranks, and in the executive offices. Like a detective, I asked questions, and tried not to draw conclusions. By eliminating what could not be true, what would be left would be the truth. I spent the evenings in the hotel trying to piece the puzzle together. I needed to find a way in to the problem. I visually mapped the relationships between what I was seeing, what I was told, and what was logical using what is called a fishbone diagram. I call the process Diamond Cutting, like a diamond cutter, studying to find the seam that will yield the most beautiful diamond. There is always more than one seam. Study to understand the structure and know where best to strike; when ready, put thinking aside, take a hammer and chisel, and swing! ...There were simply too many people telling other people what do to, and contradicting each other; there was no unity of command. At breakfast, the next day, hammer and chisel in hand, figuratively speaking, I told the owner he had to fire himself"
Think of when you over or under reacted and share it in the comments, or use a current situation, make your theory, use the chart, try the solution, and share what happens, and I'll give you personal, helpful feedback. AND if you sign up just below, anonymously or otherwise, then comment, I'll send you a HiResolution PDF of the Matrix all your own! Either way you get feedback free, and I usually charge hundreds per hour.